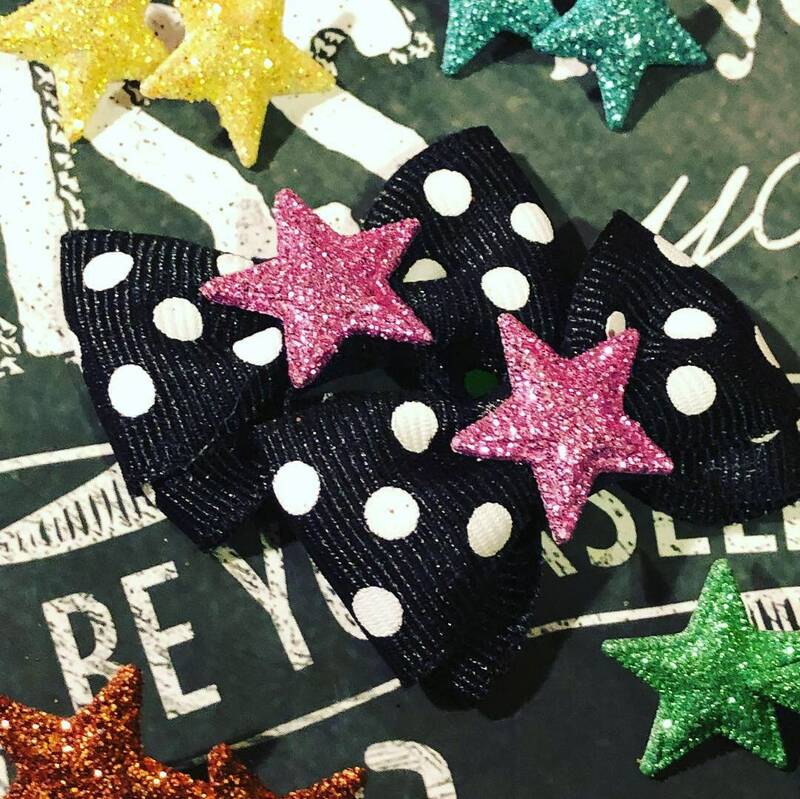 These bows are tiny and cute! Bows are approximately 1.25” and are perfect for small dogs! 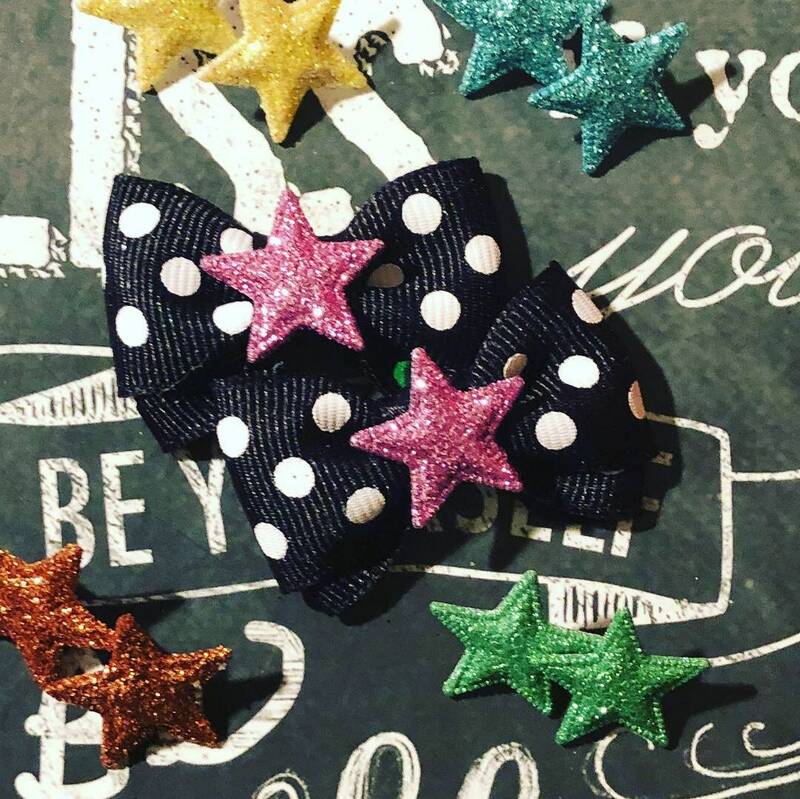 Bows are made with 1” black/white polka dot ribbon with your choice of glitter star centerpieces (orange, yellow, pink, blue, or green) These bows come standard with Latex Groomer’s Rubber bands. All bows are handmade. I accept all payments accepted through etsy.com, and I will ship within 3-5 business after payment has been received. All items are shipped via USPS within 3-5 business days after order is place. Please let me know when ordering if you need the item by a certain date. Additional charges may apply for faster shipping. Buyer will be notified immediately if there is a delay in shipping. Returns are accepted for unused items only, and return must be initiated within 14 days of purchase. Returns must be mailed back with in 30 days, and customer will be responsible for the return shipping. Please make sure you read the item description carefully. Custom orders are non-refundable. Your satisfaction with my items is extremely important. If for any reason you are unhappy with your purchase, please contact me right away. Custom orders are welcome. Please convo me for custom orders. Please allow additional shipping time for custom orders. Yes! Wholesale pricing is available to retailers. Contact me for details. CA residents will be charged 7.65% sales tax.